Virginia has no shortage of fantastic educational activities for children. Between our world-class zoos, aquariums, historical sites, and science centers, you couldn’t ask for much more. Below you’ll find 10 can’t-miss opportunities that will guarantee a great time and a wonderful learning opportunity for your next family visit. The Virginia Zoo in Norfolk, Virginia, offers children the opportunity to see and learn about more than 500 animals. The zoo has been a Norfolk fixture for over 100 years and has exhibits that span the globe. Stop by any Tuesday at 11 a.m. for Zoo Tales, an educational program featuring two different animal stories and visits from live animals. The zoo is always offering new educational programs and opportunities, so make sure to check the website often. 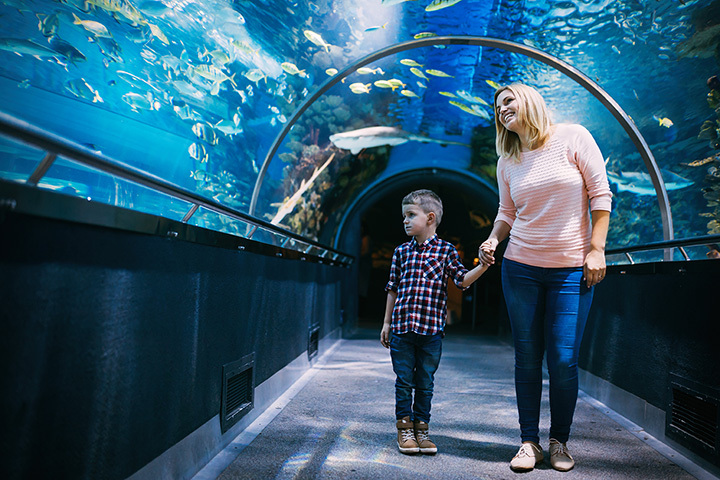 When you’re finished at the zoo, take a ride to neighboring Virginia Beach for an afternoon at the Aquarium and Marine Science Center. Choose between educational movies presented in IMAX, play dates with the animals and their keepers, and events including Sensible Seafood Week to learn more about the sea. The Jamestown Settlement in Yorktown, Virginia, recreates the earliest American colony on the East Coast. Peruse the traditional museum exhibits before walking around the recreation buildings and talking to the interpreters on-site to learn more about what life was like for the earliest settlers. The Kids’ Museum is tailored specifically to children, but the regular exhibit as well as the American Revolution Museum is worth visiting, too. The Virginia Air and Space Center in Hampton, Virginia, is an extension of NASA at Langley and perfect for the afternoon outing. The center specializes in helping students learn about science, technology, engineering and math. Exhibits are dedicated to various aircraft, spacecraft, space racers, and hands-on exhibits like Adventures in Flight and Engineer It! Stop by George Washington’s plantation home, Mount Vernon, for a day learning about our nation’s first president. Explore the historic estate that was once George and Martha Washington’s home, along with the colonial era buildings, gardens, museum and education center, and distillery and gristmill onsite. Mount Vernon is open year-round and is pet friendly. The Virginia Discovery Museum in Charlottesville, Virginia, is geared towards children less than 13 years of age. Their mission is to “foster intellectual curiosity and development for all children of our community.” Exhibits include the A-Mazing Airways, STEM Lab, Literacy Lounge, Sensory Studio, and more. Weekly programs include story time, poetry club, spatial games club, art time, and more. Check the website for regularly updated special programs before stopping by. The Luray Caverns in Luray, Virginia, provide the perfect opportunity to learn about the largest, most popular cavern in the United States. It is a world-renowned U.S. natural landmark over 4,000 years-old with an incredible array of stalactites and stalagmites. Don’t leave without visiting the organ built into the cavern. The Shenandoah Valley Kids Trail puts kids in the driver’s seat to explore the beautiful Shenandoah Valley and Blue Ridge Mountains. Join Bucket the snail as you learn about the surrounding area. Parents may want to guide their children somewhat, as the trail includes both educational and purely entertainment activities. Steer your children towards the educational, and there’s a lot to learn. The Virginia state parks offer an incredible amount of education activities. One such activity is geocaching. Park visitors use a GPS unit to find hidden treasures scattered throughout the park. Along the way, you can use this opportunity to teach your child about conservation, the importance of wildlife, and nature in general. Teach your children what life was life before modern electronics by participating in the Frontier Muster and Trade Faire at the Natural Tunnel State Park in Duffield, Virginia. Participants will dress in colonial attire, learn how to bake apple pies and cobbler as if they were on the frontier, observe spinning and weaving, processing of raw flax, as well as soap making, blacksmithing, tanning animal hides, and more. Make sure to check out the Virginia state park website for details and other regularly scheduled festivals.